“Boris is backtracking on his own plan to ban the most-polluting diesel vehicles from Central London from 2020 by allowing these vehicles to drive in for a tenner a day. I’ve lost count of the number of his backward steps on air pollution measures. “Boris must end his love affair with carcinogenic diesel exhaust. His failings include: forcing taxi drivers still to buy one of two large diesel taxis (other models don’t meet his turning circle requirement); buying expensive new diesel electric hybrid buses including his New Bus for London (which will still be on the streets in 14 years’ time); giving a 100% discount to the Congestion Charge to Euro 5 diesel vehicles emitting less than 99 gm/km of carbon dioxide (subsequently scrapped after it caused congestion); scrapping the Western Extension of the Congestion Charging zone; and proposing a so-called ultra low emission zone (ULEZ) in 2020 that has always been too small, too weak and too late. Amazingly, Boris’ ULEZ wouldn’t even ban the oldest diesel cars 10 years after Berlin, would cover about 7% of London compared to 30% in Berlin and exclude taxis and buses – which he regulates – from the standard set for others. Not one person at a large Transport for London stakeholder event last Autumn thought his ULEZ ambitious. 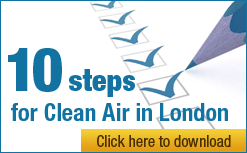 “More than two years after the World Health Organisation classified diesel exhaust as carcinogenic to humans and 60 years after the world’s first Clean Air Act was introduced for the City of London Corporation (5 July 1954), London needs to ban diesel exhaust from the most-polluted places as coal burning was banned after the Great Smog. Boris must end his love affair with carcinogenic diesel exhaust by: scrapping the turning circle requirement for taxis; fitting exhaust filters to London’s entire diesel bus fleet; requiring compressed natural gas, preferably biomethane, for all buses and freight vehicles; stopping the removal of factory-fitted diesel particulate filters in London; tightening the existing low emission zone to include diesel cars and light goods vehicles; and ensuring one or more ULEZs ban carcinogenic diesel exhaust from all the most polluted places in London by 2020 with a meaningful intermediate step by early 2018. Boris should also insist that harmful emissions are disclosed with CO2 emissions to buyers when all vehicles are sold.